Five-part drama series based on the detective novel by Wilkie Collins in which a man must find a stolen diamond to win the heart of the love of his life. Described by TS Eliot as "the First and Greatest of English Detective novels", The Moonstone sees the charismatic adventurer Franklin Blake on the most important quest of his life - to solve the disappearance of the priceless Moonstone and win back Rachel Verinder, his one true love. 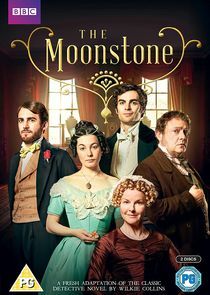 Brilliantly combining adventure with romance and some of British literature's finest characters, this classic mystery's twists and turns make The Moonstone the perfect treat for viewers.